Our hair tutorial this week is showing how to make a chain waterfall braid! We have seen pictures of this beautiful braid floating around the interwebs for awhile now, and have fallen in love with it. We have not seen a video tutorial, so we decided to take on the challenge of figuring out how to create it by studying a photo of the braid. 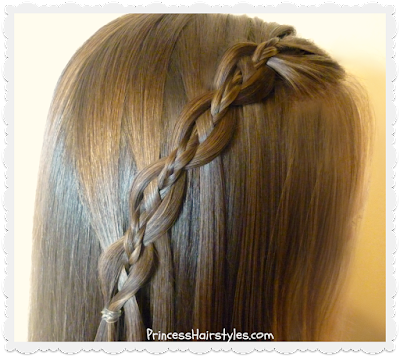 At first glance, this braid looks quite similar to a 4 strand waterfall. But, I think you will find this tutorial is much easier. The steps for making this braid are actually quite simple for such an intricate look, in my opinion. As mentioned in our video tutorial (above) the center strand of this braid can be changed out for ribbon, a micro braid, a regular strand of hair... or anything else you would like to use. 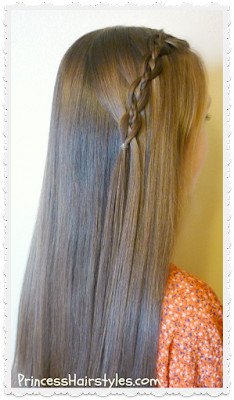 We love the look of the hair "chain" with the center strand weaving through the cascading sections in this unique waterfall braid. We created the hairstyle shown in our tutorial at a diagonal for a loose, carefree look. 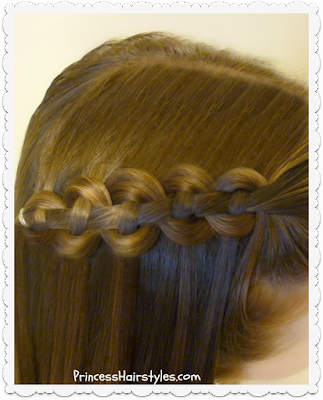 This braid can also be made straight across horizontally, as shown in our photo variations (above.) As you might have noticed, the horizontal placement seems to show off the pattern of this braid more fully. This braid would be great for many occasions and could accent hairstyles for casual or formal settings: School, church, weddings, prom, homecoming, the beach, recitals, communions, etc. 1 clear elastic to tie off the braid at the end. Pomade, hair wax, gel, or other product to help with flyaways. I know this braid has been around for awhile, but we wanted to credit the Instagram accounts we have seen photos of it on most recently, since they inspired us to make this video: la13_hair, cute_and_glossy, studiohilde, braidsglamour, thehairbraidingbasics, & miriamtogether. How do you start with the ribbon? We want to try that version but are not sure how to get the ribbon to stay in her hair as the center strand. Thanks! We love your videos!! 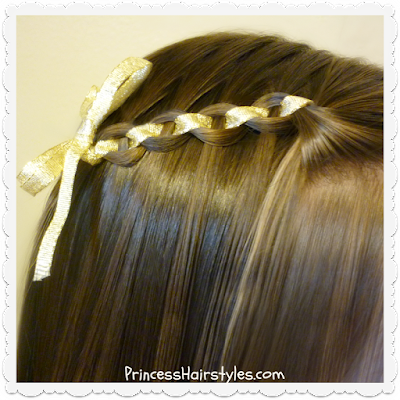 We usually place a small elastic near the top of the braid and add the ribbon to that. 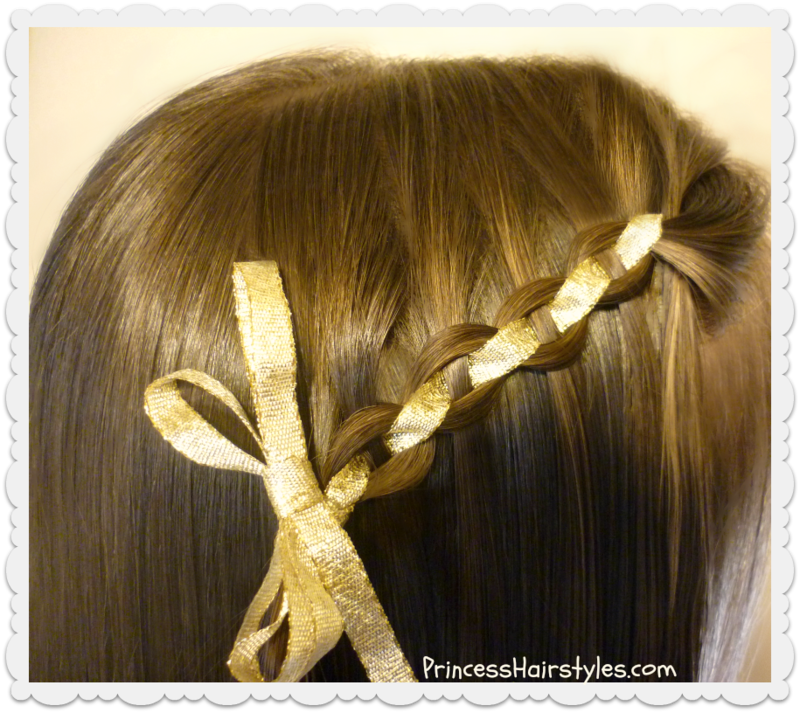 If you can place it right behind the braid, it will be hidden pretty well. Good luck!